We are looking forward to seeing lots of smiling faces at our one and only Sunday show! We will be in Oak Alley on the North Parkway side of the campus. 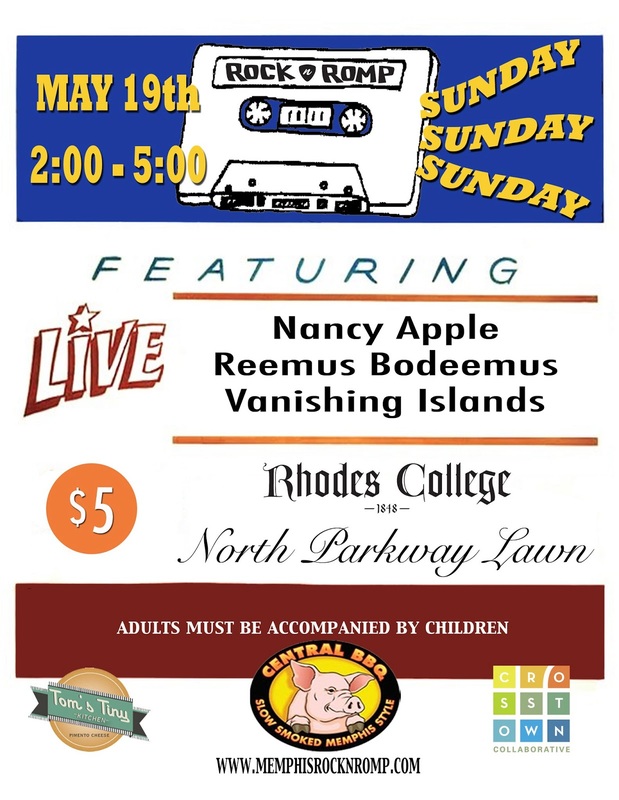 Nancy Apple, Reemus Bodeemus, and Vanishing Islands will be playing. The Crosstown Collaborative is sponsoring the show and will be leading a fun activity for the kids. We will also be sharing some information on their plans for the Crosstown area. We will have food from Central BBQ, Tom's Tiny Kitchen and Yarnell's while supplies last. We will also have homebrew from the Bluff City Brewers while supplies last. The show is from 2-5pm. Please bring a blanket or a chair, and a snack to share. Adults must be accompanied by children. Adults are asked to donate $5. Kids are free.